Product #3164 | SKU HDSPEAIO | 0.0 (no ratings yet) Thanks for your rating! The HDSPe AIO from RME is a PCIe Express audio interface for both Mac and Windows that makes the dream of an "all-in-one solution" for every possible audio application come true. Based on the HDSP 9632, the HDSPe AIO delivers significant performance gains in multi-track audio and lower latency. The card includes the latest 192kHz capable analog-to-digital and digital-to-analog converters with more than 112dB signal to noise ratio, with all inputs and outputs, including digital (and all available via included breakout cables) simultaneously operational. 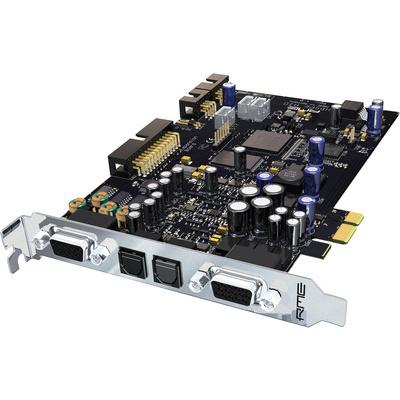 Easy-to-install optional high quality analog expansion boards, TotalMix software and a clock section with maximum jitter suppression of external clock signals all combine to provide a versatile and fully featured soundcard. RME's secure flash update technology allows for firmware improvements, adjustments and bug fixes to be installed easily at any time. Up to 18 inputs and 20 outputs can be used simultaneously!